Amazon SEO and Amazon PPC are the two cornerstones every Amazon marketing campaign should build on. If you want to boost your sales and grow your Amazon business, SEO and PPC are the best ways to start. But is one better than the other? What’s the difference? And where should you start? In this article, we will look at what Amazon SEO and Amazon PPC have in common, and how they differ. We will explain how the two work, and why the most effective Amazon marketing strategy must include both. 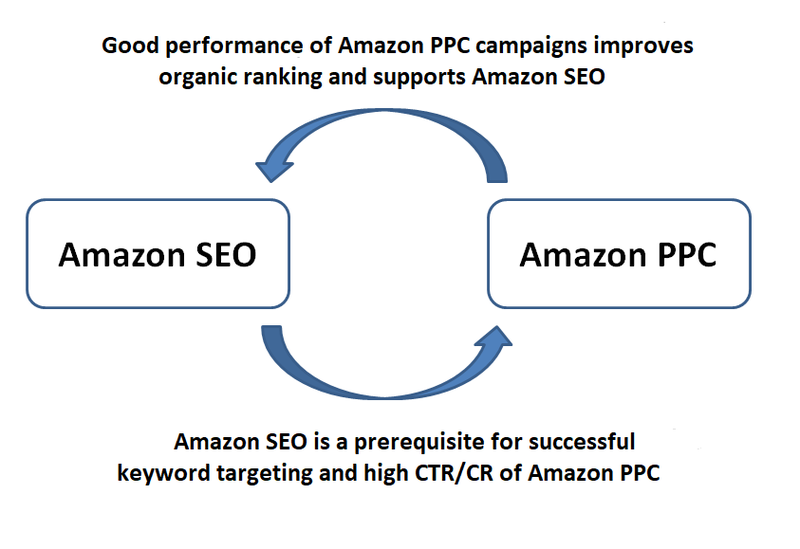 What’s the difference between Amazon SEO and Amazon PPC? Amazon SEO and Amazon PPC effectively have the same goal: getting your products displayed higher in Amazon search results – and that’s important because greater visibility means more sales. However, even though the desired outcome is the same, the approach of the two marketing tools is fundamentally different. Amazon SEO focuses on improving product visibility through listing optimization. By including all relevant keywords and adding content that positively affects click through and conversion rate, Amazon SEO improves the organic ranking as well as sales performance of product listings. The main benefit of Amazon SEO is that it is free, and product indexing (meaning that a product appears in search results if there is an exact match between search terms and keywords on the product listing) happens straight away. The disadvantage is that it can sometimes take quite a while for the product listing to climb the ranks and gain greater visibility. Amazon PPC makes use of ad campaigns to draw more customers to your product listing. For the sake of comparison, let’s focus on ‘Sponsored Products’, the most commonly used type of PPC campaign (other formats are ‘Headline Search Ads’ and ‘Product Display Ads’). Here is how it works: You make a bid on keywords that are relevant to your product listing. A customer uses that specific keyword, or related keywords, in his/her search, and your ad will pop up and be highlighted in the search results or product page. Successful campaigns require regular optimization efforts, such as CPC adjustments. This means that the search range for Amazon PPC is greater than Amazon SEO, since it is not just exact keywords that trigger the ad to appear. Furthermore, Amazon PPC has the advantage that visibility improvements (and with that sales) happen very quickly, sometimes even instantly, depending on how high the bids on specific keywords are. The effects of PPC campaigns can therefore be measured immediately. The drawback with PPC campaigns is that they require a budget, as you pay per click (PPC – pay per click). 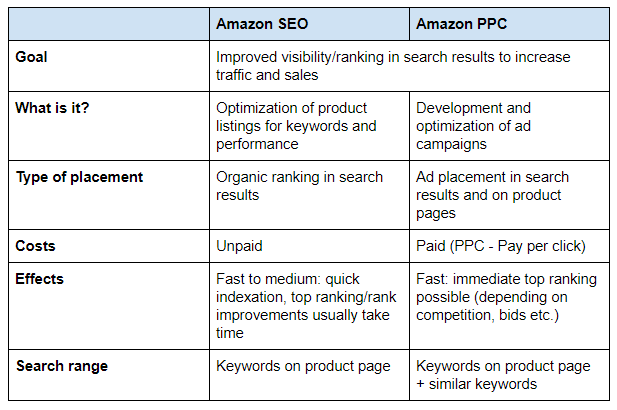 The differences between Amazon SEO and Amazon PPC are summarized in the table below. The strong positive reinforcement between Amazon SEO and Amazon PPC leads to even more significant improvements in ranking and boosting sales when both are used at the same time. Ad display on Amazon is based on relevancy. That means that Amazon only shows your PPC campaign, if it is relevant to the search term of a customer. PPC campaigns can therefore only work, if a product listing was first optimized for relevant keywords – using Amazon SEO. The desired outcome of each PPC campaign is increased sales. Sales happen when customers click on a product page, and convert to buyers. And what helps improving CTR and CR? Amazon SEO. 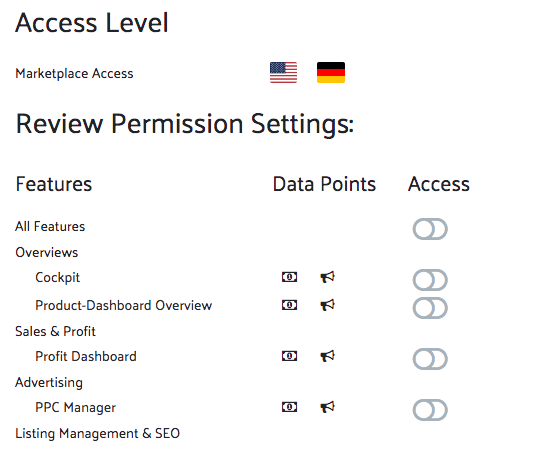 Identify relevant keywords and optimize product listings for higher ranking and better performing PPC campaigns with the Sellics Keyword and Content Tool for Amazon Sellers and Amazon Vendors. Sales have a direct influence on a product’s organic ranking. Therefore, more sales generated via PPC ads will have a positive effect on a product’s organic ranking. This effect is especially important for new products. New products usually lack a sales history, and therefore performance data, which in turn negatively affects organic ranking. Amazon PPC can change that by driving traffic to the product listing and thereby boosting sales. Amazon SEO and Amazon PPC in themselves are both effective marketing tools to increasing sales on Amazon. But their effects can be further amplified when both strategies are combined. It is due to the strong correlation between Amazon SEO and Amazon PPC explained above that you should combine the two, rather than choosing one or the other. If you however, need to decide on a starting point, we would recommend getting started with Amazon SEO first, as keyword and listing optimization are prerequisites for successful PPC campaigns. Whether you are an Amazon Vendor or an Amazon Seller, you can use Sellics to optimize your Amazon ad performance and decrease manual hours spent on PPC management. We offer a 14 day free trial to test all Sellics features.